Loving the tip on choosing a bag that is a similar shade to what you are wearing. I'm loving the colour of that Balenciaga bag! Hope you had an amazing weekend! Great pairings al always! Hope your week is off to a good start! Hi! Happy new week! I absolutely adore both looks! Your accessories make the dresses pop beautifully! Thanks for the great tips and have a beautiful week! I cannot wait to break out all my maxi dresses once it's a bit warmer. They are the easiest outfit-makers! You look so good in maxis, I wish I felt as confident in them as you. I just always feel overdressed even if its a more casual piece, dunno what it is! I just like them so much I'll wear them everywhere, haha! Loving the monochrome look of your matching bag and dress! I also love the ease of a dress. Not having to think about pairing anything together is so nice. i like both dresses and loving the second bag!!! Dear Mica, I'm always impressed how perfect you look in a maxi dress! You are right: it is really an easy way to dress - unfortunately I never look as good in a maxi dress like you! Have a happy new week. Love a maxi dress on you - so cute! You look amazing in these maxi dresses, I especially liked the blue one on you. 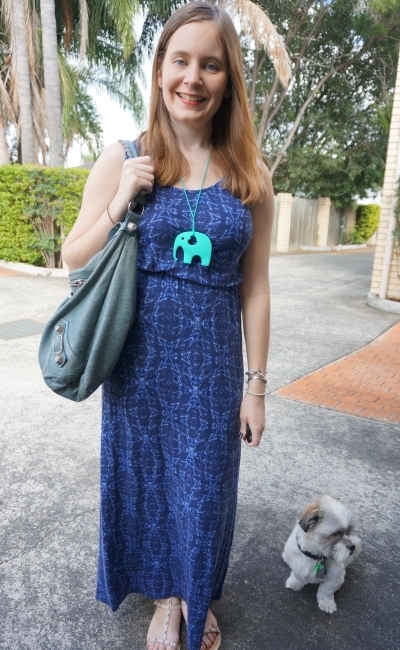 This is so cute, I'm loving te blues and your elephant necklace is so cute! Thanks Kim! The years are flying by! I really like the second outfit a lot. Despite being such a casual combo the color and the bag make it very elegant. You look so great in maxi dresses! I've said this a million times and I probably sound like a broken record but I can't help but admire your maxi dress collection! Both looks are lovely, as usual. I'm going to have to invest in a few maxi dresses for the summer myself! I really need to update my wardrobe with a couple of new maxi dress. I often forget how versatile they are and one can easily dress up and down with a maxi dress. Love the blues and greys you are wearing here. YOu look so cool and chic In maxi dresses! I love both maxi dresses and those bags are perfect with them. I've been looking longingly at my maxi dresses and can't wait to wear them, but it needs to be just a tad warmer. I love the bright colors you've paired with these. I think I need some bright necklaces to spruce things up a bit this summer! Hard to complain about lots of gorgeous blue! Though I do think grey and yellow is one of my favorite combinations. I love the patterns on your maxi dresses! You have lovely taste! 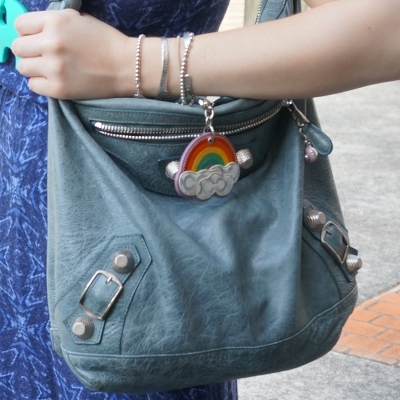 That grey bag is amazing! So pretty! And your doggy is so sweet in the photos! Absolutely love these maxi dresses on you! I think maxi + gladiator is a match made in comfy heaven. I love maxis for the comfort they serve as well ease of styling. Gosh these two looks are perfect but I'm drawn tot he tie dye, great alternative to a jumpsuit. I can see why all the blue would make you happy ;). I love how you did this post, why you wore it, Last worn, so cool. I love a good maxi, can't get any better then that! I love maxi dresses, the second one is cute! Me too! I love maxi's so much I'm actually thinking of featuring my latest one in my next shoot - unfortunately the weather has been terrible to get outside and actually shoot it! I loooove a good maxi dress in the spring + summer! You look great in both looks, lady! I never used to really be a fan of maxi dresses, simply because I couldn't really find ones I loved and that fit my body in a flattering way. Now that I'm pregnant, it's a whole other story, haha. I've been searching high and low and have built quite the collection and I'm still keeping my eyes peeled. I love both your dresses, especially the second one, it's so pretty with the tie dye print. Thanks for sharing and I hope you're having a lovely start to your week! Love that pretty maxi. And your quilted bag! I should really get a few more maxis--they really are so fun!! Such beautiful dresses and matching bags! Wonderful looks for spring and love the yellow necklace on the grey outfit, such a cool color comb! This post shows off two things I think you have such an awesome collection of--teething necklaces and maxi dresses. I love all the ones you're featuring here, especially that yellow necklace! Gah... baby boy's first birthday party? How is that even possible??? Maxi dresses are one of my favorite go to summer outfits! Classy and simple. Love the maxi dress. That second look is perfect for chasing after kiddos! I love the necklaces you wear.. so fun! Mica I am a handbag fan so you have a great collection, love the steel blue color. The maxis look perfect on you and so comfy! Love your little furbear's haircut! Thanks! They are teething necklaces :) So fun to wear, and they keep the kids amused!